Only 3 of the 20 games had a goal difference of more than two goals and, excluding Portugal’s 8-1 win over Azerbaijan, the average goal difference in matches was just 1.16 per game. Only eventual champions Portugal won every group game. Pre-tournament favourites Spain, who were so dominant last time, made the final winning only 2 games and both were narrow 1-0 victories. There were lots of interesting results and performances and I have reviewed each team below followed by my team of the tournament. Despite taking a fortunate lead against Portugal in the quarter final before they lost 8-1, they got their tactics wrong even though they played strategically intelligently in their group matches. Pivot Bolinha impressed early in the tournament. They did superbly to grind out a result against the defending champions Spain by sitting back and counter attacking. I think in four years, with how their league is developing, they will be back with a much more expansive game. One of Europe’s rising nations. Surprisingly they didn’t take any pivot until they brought Fortino in during the tournament for the injury to their captain Lima. This left them with their only attacking threat in Merlim. I think it is time for them to make some big decisions for the future after performances here and at the World Cup. Only penalties away from making it to the final, demonstrating they are one of Europe’s strongest teams. Heavily reliant on their three Brazilian born players but the others also have talent. Fantastic performance again with the guidance of Head Coach Cacau who is leaving the team. Will be interesting to see the impact that losing their influential leader will have. Did well to earn a draw against Russia after a fantastic performance from Kałuża in goal and some last ditch defending. A young team that should qualify in 2022 with the aim to make it to the knockout stages. Before the tournament said that they couldn’t rely on Ricardinho and, even though he was still their best player, several others took on responsibility. Best attacking team scoring by far the most goals. Showed confidence in themselves in the final which was missing previously, especially against Iberian rivals Spain. Didn’t look in the best physical condition and used the fly goalkeeper to try to waste time. Not the level of the Romania of a few years ago. Disappointing from Russia whose defence managed to get them to get the 3rd place. So much talent but doesn’t seem to come together well. Will this generation ever win silverware despite getting close time and time again? Despite not winning a game, they performed admirably and only poor finishing stopped them from defeating Kazakhstan and going to the semi-finals for the second tournament running. Star players demonstrated their quality again. Fought like warriors to get to the quarter finals but I felt they could have done much better if they had not limited themselves to using such a small number of players. They have to give trust to more players going forward. In 2016 they relied on set plays and stealing the ball high up the court to set up counter attacks as their attack didn’t function well. This time they didn’t steal the ball high as teams knew not to risk in possession but set plays were a reliable source of goals. Losing the potency of one of their weapons wasn’t enough to retain their title even though they had the better chances in the final. A new team that risks more in possession than before. Even though it got them to the same position as the last four Futsal Euros, this is a team that has a bright future and could finally get them past the quarter finals. Leo Higuita (GK) – No goalkeeper has as much influence on his team as the Kazakhstan goalkeeper with his role in their attacking play. Was also one of the best shot stoppers at the championships. Adrian Pola – He was my player of the tournament in 2016 and he was again Spain’s best player and got the winner in their two victories. Bruno Coelho – Scored in every game as well as two in the final plus four assists. Really stepped up his performance in this tournament to take some of the weight of Ricardinho’s shoulders. Douglas – Incredible performance with the highest assists in the tournament. Complete player that could play in any team in the world. Ricardinho – Shone again throughout and got the only achievement he was missing in his career, a title with Portugal. Became the tournament top scorer for this edition and the history of the championships, overtaking the legendary Russian Tsar Eremenko. A genuine superstar that we are fortunate to have. 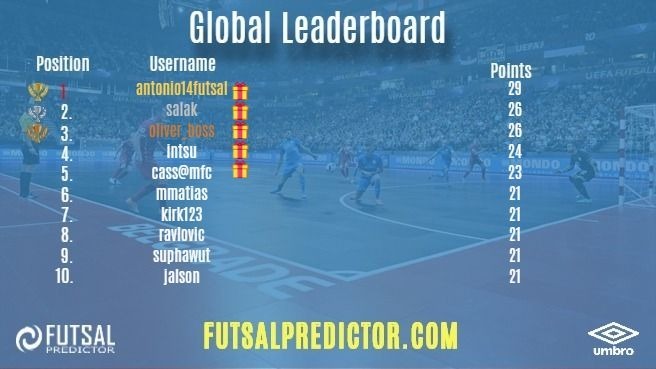 For these championships I produced a score predictor game called Futsal Predictor and just under fifty videos providing analysis and comment. The idea behind doing these was to achieve two things. For any entertainment to capture you I believe you need to know the story behind it and feel you have a personal interest in the outcome. We have the most spectacular and skilful sport to watch but spectators also need the information that will result in them being emotionally captured by what is occurring on court. It was a significant financial and time investment but it will have been worth it if it helped engage people in the championships and in elite futsal going forward. More interest in the elite game is the only way we will generate our own funds to develop the sport. There were some very impressive performances with a couple of players getting 14 out of 20 results correct and the winner correctly predicting 25% of the scores correctly. The Top 5 players won prizes contributed by Umbro including their new Chaleira Pro shoe which was worn by three of the winning Portuguese players. We now have to wait four years until the next addition and with four extra places up for grabs it will be interesting to see which teams qualify for UEFA Futsal Euro 2022. 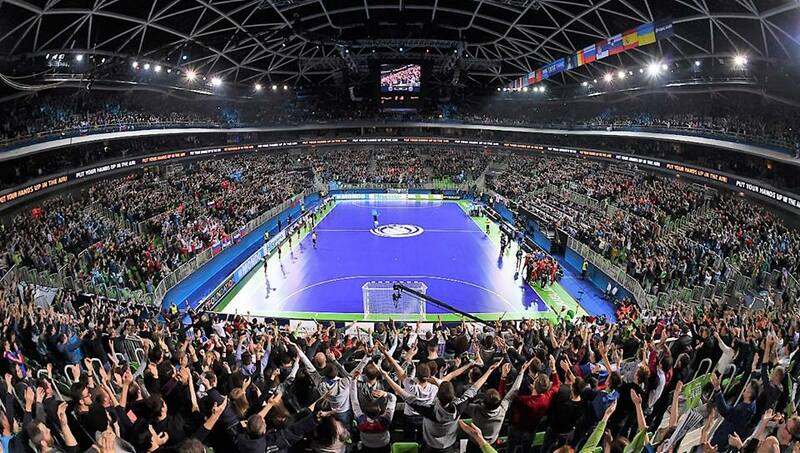 In the meantime, for European international competition, we have the Women’s Futsal Euro and U19 championships to enjoy in 2019.